Clothespins, socks and a clothesline. To train the jumping and stretching competencies of children. Parents fasten the socks with the clothespins over the clothesline (using hangers for draping socks is also acceptable). 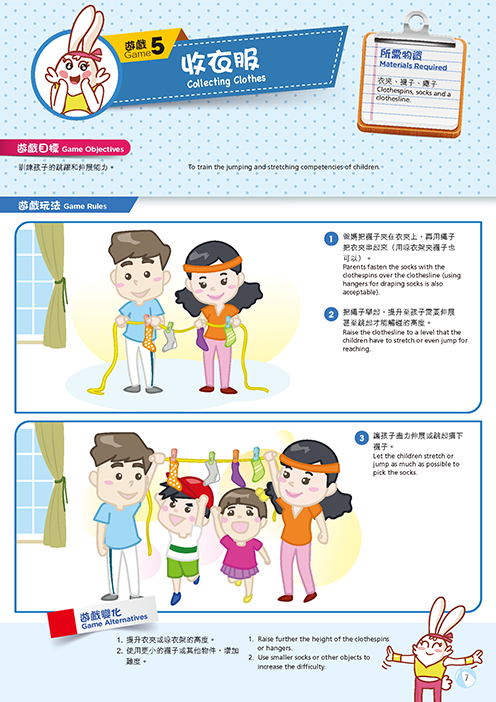 Raise the clothesline to a level that the children have to stretch or even jump for reaching. Let the children stretch or jump as much as possible to pick the socks. Raise further the height of the clothespins or hangers. Use smaller socks or other objects to increase the difficulty.